My Music Radar! 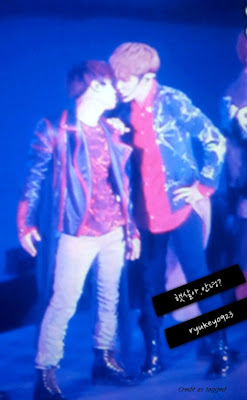 : Have you seen the latest JongKey? Okies babies, I really wasn't gonna post this, cause, well cause I really kinda thought JongKey was a dead issue. But! While in Japan and Taiwan, there just has been so much! Every time I think its done and over.....they are back at it. Like during SHINee's recent appearance on '100% Entertainment' while they are playing the basketball game, Key casually walks up to Jjong and back hugs him! After re-watching several times to be sure, indeed he did. Today on Tumblr I found these gifs on my dash and once again, JongKey shows up. Jjong! How dare you gaze at and caress Key like that!